GREAT OUTDOORS: The RHADC has a sailing programme for all ages and abilities. Learning to sail not only provides a healthy, outdoor activity for your children but also teaches them self-confidence, resourcefulness and independence. At the Royal Hamilton Amateur Dinghy Club (RHADC), children aged five to 18 can learn how to sail a range of different craft, imbuing them with a lifelong love of the sport. 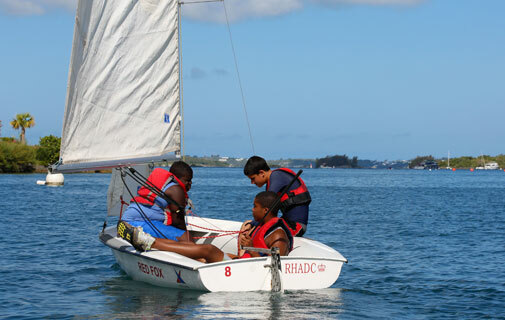 The RHADC’s sailing academy produces young sailors who go on to compete in regattas both in Bermuda and overseas. Recently, a group of junior sailors took part in the O’pen BIC World Championships in Italy, while the RHADC also runs events throughout the year. But even if you just want to have fun, the RHADC has a flexible programme to cater for all ages and skills. Its summer camp in July and August is always popular, but during term-time it also runs an after-school sailing programme. Neil Redburn, RHADC rear commodore, said: “There are five different skills levels and five different types of boat. “We use the US Sailing curriculum, and aim to inspire children to take up sailing as a lifelong pastime. “Sailing is about independence, discipline and focus, but is also a lot of fun. “There’s a definite progression to the sailing programme, which develops the child into a sailor from the age of five and up, into their teenage years. “If you are thinking of signing up your child, sailing is a fantastic sport that will keep them fit. “Our programme is all about learning to sail in a safe environment. Mr Redburn said: “Different age groups are matched to different types of boats. “Optimists (Optis) are the standard boat for children learning how to sail, from the age of five up to 15, while 12-year-olds can move on to O’pen BICS, and 14-year-olds, 420’s. “At 15, they can then move on to Lasers and Bytes, and at 16, 29’ers. As the kids get more experienced, the boats get more technical. “As young adults (17-18-year-olds), they then move on to two-man keel boats such as 420’s, and learn more about teamwork. The RHADC’s fall sailing programme runs from September 16-December 15, from 4-6pm on weekdays, and 10am-12noon and 1-5pm on Sundays. During the school holidays there are also sailing camps and events, such as the Frostbite Series over Christmas. “We also send kids to the Fall Harvest Regatta and Orange Bowl Regatta in Florida,” said Mr Redburn. Up to 40 children of various ages from across the island enroll in the sailing programme each term.